Introduction to where did meditation originate? Where did meditation originate? 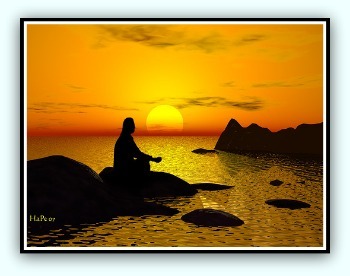 Well the word meditation originates from a Indo-European root med-, Which means to measure. The root med- is also from English words such as medicine, mete, moderate and modest. Through the Latin word meditatio, it came into English. Meditatio originally meant every type of intellectual and physical exercise; it later developed into the more precise meaning of contemplation. Many people would trace the roots of meditation back to Asia. The earliest written meditation techniques which are Hindu scriptures known as tantra's date back to 5,000 years ago. According to archaeologists who found a yogi figure practicing yoga this establishes meditation's existence in the Indus Valley, the first Indian civilization. We have to go back even further than this to try and find meditation's origins. It is possible that the practice of meditation might have begun by early man staring into flames from their man made fires for long periods at a time and falling into a relaxed state. Alternatively, it can be similarly argued that staying in dark caves for a long time can lead ones mind into a trance like state, as evidenced by various cave paintings in the stone age period. The San peoples cave paintings depicted their visions, they show animal spirituality, when they did these paintings they were in a meditative state. Even further back there is evidence although disputed which suggests that Neanderthals were the earliest hominids to bury the dead in shallow graves with animal bones and stone tools. See Neanderthals knew about herbal medicine. Australopithecus garhi is thought to have used stone tools. The Australopithecus garhi is not a human ancestor species. It is a competitor species to the ancestral species to the Homo genus. Often when a gorilla or baby chimpanzee dies, the mother will bring the body around with her for several days. Where am I going with this? What I say is this, if it is possible for Neanderthals to bury the dead, if it possible for Australopithecus garhi to make stone tools and if it possible for chimps to display some kind of philosophical thought, then it is possible for all these species to meditate in some way. So the question of where did meditation originate? Is not as straight forward as one might think.